I spent a lot of time earlier this spring thinking about what I wanted from this year. I compete in three different sports, and sometimes I struggle to figure out how to make it all work. My first sport is dog agility, which is a sport where the dog is the athlete and I’m the brains of the team–but I need to keep up, too, which requires all-out sprints lasting 30-to-45 seconds. My third sport, triathlon, is an outgrowth of the first two sports. I started with cross-training for running, because I simply couldn’t run every day without hurting myself; I swim for the love of how I feel when I swim; I bike because my husband enjoys it when I go on rides with him *and* because I enjoy the scenery and the company. And I’m competitive, so once I was doing all three things, of course I had to try a sprint triathlon–and a sprint tri is FUN. Just when you get bored of a sport, you’re on to the next one. And the roads are pretty much cleared of traffic for the bike ride, which is just sheer joy! I also started working on a persistent dog agility problem, one I’ve had for years. 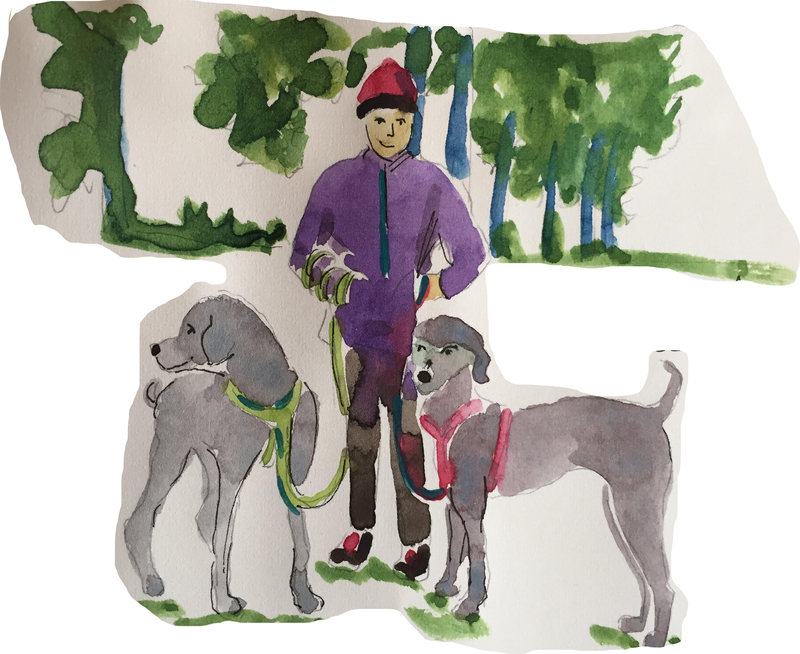 I get momentarily lost on the course (which changes every single time, and which you get a limited time to plan for, and which the dog has never seen before)–and then everything goes to hell really fast, and I’d end up just walking out. With my dog agility instructor, we started setting up sequences where I was pretty much guaranteed to get lost–and I just kept working to get past that roadblock. I did not expect these two actions–working on my confusion and working with a tri coach–to have any cross benefits. 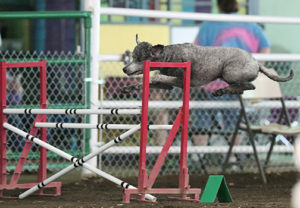 I certainly didn’t expect learning to deal with dog agility problems to affect my running! And yet, the cross benefits have turned out to be huge. The next trail race, I decided I would, instead, channel Steve Prefontaine and his attitude: give it your best and then dig deeper than that. When the same runner passed me near the top of a long hill (at that point, she’d beaten me in 5 of 6 races), I stuck with her and then passed her back as soon as the course turned flat–and refused to look back and see if she was gaining on me. That worked. I turned 63 two weeks ago. When I was growing up, women were generally not expected to be serious about sports; nor were we supposed to be competitive. I still talk to women my age who are surprised and slightly appalled that I talk openly and aggressively about playing to win. Lately, though, I’m facing the facts: I like myself better when I don’t let myself back down. 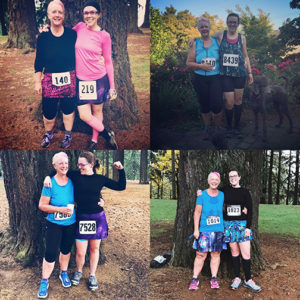 This entry was posted in life with poodles, running, training on July 18, 2018 by Diana. My mother didn’t much like children. I don’t think she liked people in general, honestly, but she really thought children should be “seen and not heard,” and she definitely lived by that credo. I was luckier than most children in that situation, though, because she hired a nanny/housekeeper to manage the house and the children so she could work. Mrs. Day was an African-American woman, about ten years older than my mother, whose one son was grown; she was hired when I was six months old in 1955, and she died when I was forty. (I was on the way to see her, but didn’t make it in time. I take some comfort in knowing that she knew I was coming.) I don’t know much about Mrs. Beatrice Day; I know she grew up in Virginia and came to live in the Philadelphia suburbs with her husband Benny, whom I think worked for the Pennsylvania Rail Road (PRR), although I’m not sure why I think that. Maybe I heard it once? Mrs. Day loved me, took care of me; later she taught me how to cook (my mother didn’t cook). We went to a lot of places together, including her AME church in Bryn Mawr, Pennsylvania, where I learned to love gospel music (although my parents, staunch atheists both of them, slightly disapproved, I went with her whenever they were out of town, which was often, since they liked to travel, preferably without children in tow). We saw a revival screening of Gone With The Wind in 1966, a fancy showing where we both dressed up and sat in the balcony with great seats that had been given to my parents, and I have to wonder now what Mrs. Day made of that, but I remember crying through the sad scenes (when the pony dies) and then running to make our trolley back home. She made me run ahead to catch the car and ask them to wait for Mrs. Day. Everyone knew Mrs. Day; she was an important person in her circle. (We took the P&W trolley rather than the train, I remember, which meant we had to run to catch the last trolley.) There are pictures from 1969 of the trolley at both 69th Street station (where we got on) and the Haverford station (where we got off) here. I didn’t question it at the time, but the train (the Main Line train, from 30th Street Station to the train station in Haverford) was for white people, and the P&W trolley was for black people. I liked the trolley much better–it was just more fun–it clacked along slowly and you could open the windows on hot days. Less expensive too. Mrs. Day genuinely knew everyone. I remember getting told off by her for being disrespectful to one of the lunch ladies at my elementary school. I was embarrassed, but also not at all surprised that she knew about it. At the same time, I was growing up in the well-off Philadelphia suburbs, where it was mostly Republicans–although my parents were both Democrats, and my mother ran for a township office and got more votes than any Democrat ever had, while still only getting 10% of the vote–where it was still segregated, mostly. But I also went to a Quaker elementary school, and the older brothers of my friends were traveling to the deep South to sit-ins and demonstrations as part of the Civil Rights movement of the 1960s. My school gave scholarships to a few African-American students from the local community. As I went into high school (a private all-girls school), the Civil Rights Act of 1964 had passed a few years before, Martin Luther King was making waves and having an impact, the Black Panthers were creating a movement in Oakland, and equal rights were having their day. I was thinking about all of this last week, when I went to Washington DC to see the newest Smithsonian museum, the Museum of African American History and Culture (https://nmaahc.si.edu/). It’s not an easy museum to visit–since it opened over a year ago, it’s been so busy that there’s a ticketing system. You have to go online at 6AM (Pacific time) the first Wednesday of the month to request tickets for three months later (and they are gone quickly, although they’re free (your tax dollars at work)). That’s how I ended up going to DC in December; I started trying to get tickets last February and didn’t succeed until September. There’s also a reconstructed slave cabin and a guard tower from Angola prison. As I said: horrifyingly thought-provoking. And in the week since, I find myself wondering: why did I never ask Mrs. Day about her childhood? What was it like for her growing up? 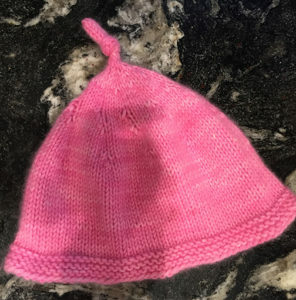 I know she didn’t learn to write until she worked for our family–how did that happen? The upper floors of the Museum are devoted to African American Culture and are far more cheerful. Rosalind and I skipped to the floor devoted to music, movies, TV, and cuisine. I got to see Chuck Berry’s red 1972 Cadillac convertible. There was great music. There were costumes worn by black musicians. It was a lot of fun, that floor. We had lunch in the cafeteria, which has four areas, devoted to regional black cuisine. I had “western-style ribs”, which were good. Better than good. After that experience, Rosalind and I walked to the National Botanical Garden and its Conservatory and admired orchids and other tropical plants. It was restful, but we continued talking about the (other) museum. We talked about the family history: distant Dickinsons owned slaves in western Virginia. Not many, not a plantation, but one or two (accounts vary) before moving to Kansas in the late 1840s. That’s pretty much all I know. I don’t even know their names. The next day, my cousin Cindy Dickinson and I went to the Belmont-Paul Women’s Equality National Historic Monument, a tiny house that was the site of the campaign for women’s suffrage a century ago. (The Constitutional Amendment passed in 1921.) There were four people there as we toured the house with a knowledgeable docent. No tickets, no waiting. For that matter, no fancy metal detectors or security guards, either. In reflecting on my trip, I find I’m saddened. During the 1970s, as I started my working career, women and African Americans didn’t have full protection under the law and were often discriminated against. We still are, even though another forty years have gone by. I hoped for better, back then, and now I’m hoping we don’t slide backwards. This entry was posted in life with poodles, off topic on December 12, 2017 by Diana. I’ve been working on deliberate practice for Rush’s contacts. There are two pieces to the process: I need to practice holding Rush to my criteria AND Rush needs to practice meeting those criteria. For quite a while, I’ve been using the principles of deliberate practice that are explained in the book Peak to work on small chunks of courses, rather than doing whole courses. It’s a challenge to make that kind of deliberate practice fun for the dog–but Rush loves speed, so this is what I did. I set up a speed circle around the outside of the arena, no tricky handling, just straight approaches and every thing set up to make it straightforward and fast. Rush loves speed and has had trouble with his two-on-two-off stopped contacts. I started with one round of slow running, giving Rush a cookie for each contact before releasing. Then I started doing faster laps, rewarding his stop with a release to go on. After a few rounds of that, I was running as fast as I could and Rush was still holding his contacts even as I sprinted past him. There are two parts to this. One is the speed circle and the other is adding the contacts to the speed circle. When I set up a speed circle with Rush, I use the full length and width of the arena to set up a course that is a big circle without handling complexity. The jumps are set at spacing that makes sure he is running in full extension or near full extension. Rush has a huge stride, so that distance can be twenty-five feet or more. When he really gets going, I’ve seen him bounce-jump an 18 foot distance. The arena where I train is 70 x 120 so the full-speed-ahead circle–when all I’m training is full-on sprinting for both of us (which I also call aerobic agility because I use it to develop aerobic fitness for both me and the dog)–is tunnels in all four corners, one jump in the middle on the short sides, and three jumps down the long sides. Those jumps can be the broad jump, tire, double, triple, wingless or winged. I often replace the corner tunnels with short-bar wingless jumps (using a four-foot bar) because dogs often don’t see those jumps and that allows me to practice that skill too. Or I’ll put big winged jumps out in the corners with five-foot bars and work distance on those corners. When I want to train fast weaves at speed, I replace the middle jump on both sides with six poles. If that goes well, I set up twelve poles. When I set up this kind of speed circle, I will do three or four rounds of the circle (changing directions halfway, so as to work both leads) before I stop and reward–so thirty or forty obstacles, then a long game of tug and chase-me, which are my dog’s favorite rewards. Rush LOVES running fast though and is in excellent condition, so I would absolutely stop and reward WAY more often with a dog that doesn’t love the game. For a speed circle with contacts, I replaced the jumps on the long sides with the a-frame and the dogwalk. The teeter was on a long line down the middle so that I could make a long skinny circle with the teeter. Because the teeter is unidirectional, I didn’t put it in the larger circle, since I like to train both leads. If you’re familiar with the athletic training concept of high-intensity-interval-training (HIIT), speed circles are how I implement HIIT for me and for Rush. I have to run all out, and so does Rush. It’s great for teaching obstacle focus. Now, Rush is a big dog, very fast, and is not naturally inclined to work at a distance. With a dog that likes to work at a distance, the catch is that you may be tempted to not run at YOUR top speed because you can instead stay on the inside of the circle and direct the dog at a distance. That’s cheating yourself of the opportunity to do some fun agility HIIT. This entry was posted in life with poodles on October 24, 2017 by Diana. I’m quite competitive with myself. I like to see evidence of improvement when I’m working on things. I enjoy running, for example, but I also want to get faster and more fit as part of my running. I’ve been working on improving my fitness in many ways, including by losing weight, for years now. I’ve been training in dog agility for 13 years this summer and I’d like to thinking I’m improving. I run some races year after year, looking for improvement in my times. All of which begs the question: how do you measure improvement in these areas? Take weight management and a healthy diet, for example: Is it good enough to maintain a steady weight if the average Jane gains a few pounds every year? Exactly how much (how little?) sugar should there be in a healthy nutrition plan? Should you judge healthy nutrition by blood sugar and blood lipid levels? And how do I measure improvement in dog agility? More Qs? More interesting Qs? Not worrying about Q-ing? For a long time, when I first started running Rush, my goal for any given run was not to be barked at; Rush was inclined to yell at me if he thought I was late with a cue. These days I mostly get through courses without being barked at, and sometimes we run clean, and sometimes I measure success by not getting lost and sometimes I measure success by directing Rush through a course faster than dogs we normally lose to. More often, though, I try to think of each agility course as a unique challenge and not compare my success with anyone else’s including my own ideal self. This entry was posted in life with poodles on July 6, 2017 by Diana. You can see from this photo that Rush was in peak condition for Nationals. Nationals went pretty well. I was disappointed to find that there were only two 24″ dogs competing! Following a friend’s advice, though, I decided that I would compete with myself to challenge myself every run. In the end, Rush was first in 24″ standard and first in 24″ games. We got four Qs (all of them first places) and three near misses (a single bar down in each of the three runs). In Jumpers I completely forgot the course halfway through; Jackpot was just too challenging (only 8 dogs Qd of the 309 competing). RushD_SatStandard_CPENAT_2017 was our best run; Rush had the third fastest qualifying run of all the dogs in all height classes. This entry was posted in life with poodles on June 15, 2017 by Diana. I have spent the last four months obsessed with being ready for CPE Nationals, which begin in about ten days. Rush and I have been running. I’ve done intervals and hills and taught him to swim. He’s clipped down so his coat will look its best (one last cleanup groom just before we leave). I’ve got my clothes and my shoes planned. As for training, I’ve been training everything I can think of: ten treats work (ten jumps, ten treats), jump lines for strength and jump curves to keep each lead balanced, threadles on a verbal, backsides on a verbal, contacts and more contacts, weird weave entries, his go-to-leash cue. I’ve worked startline stays to the point where he yawns when I do them no matter how far away I get. I’ve worked jump-weave openings and tunnel-weave discriminations. I’ve done zen circles on both leads and zen ovals and zen circles with doubles and tunnels, even. I’ve worked front crosses and rear crosses and blind crosses and pushes and pulls (he pulls way better than he pushes!). I don’t know what else there is to work, honestly, although I’m sure the judges will come up with something I missed. That’s their job, right? I’ve got the fan for the car and ice packs in the trunk. I’ve got rain gear. I’ve got an ex-pen I don’t expect to need. I’ve got extra socks and extra shoes and all the shoes have been tested on grass and dirt and even turf. I don’t think I’ve forgotten anything. This entry was posted in life with poodles on May 7, 2017 by Diana. Listening to your inner critic? I have had nothing to say for about two months now. I wouldn’t say I’m depressed, but I have been stuck for things to say that belong here, where I try to keep politics and personalities pretty much out of it. I’ve been writing postcards to my elected officials. I’ve been obsessively reading newspapers. All of which is irrelevant to my readers, and I apologize for the long silence. A few weeks ago, a friend, whom I have known since we were both seven and in second grade together, came to visit for a few days. We wandered Portland, ate some good meals, talked about drawing and art and dogs. We talked about our parents, who were part of a group that met every other Friday to take dancing lessons (at the house where I grew up). We visited Portland’s Pittock Mansion together (and I pointed out the pantry sink and yes, she remembered the pantry sink in the house I grew up in) and we wandered the Japanese Garden. And Adrienne told me something that completely stunned me. She didn’t learn to read until she was ten. She still doesn’t see herself as a fluent relaxed reader. You will have noticed that I said we’ve known each other since we were seven. Memories of Adrienne from our shared childhood are lodged deep in my memory. When we were ten and in fifth grade together–the year Adrienne said she learned to read–there was an assignment to illustrate a book we ‘d read. Adrienne did a set of three tiny three-dimensional dioramas of short stories from a collection by a writer whose name I remember as “Sake” but googling has drawn a blank, except for a British writer who used the pen name “Saki” who might or might not be the same writer. (I talked to Adrienne, yes, the author was Saki.) But I remember the dioramas so well! They each recreated a scene from the short story. One of them had a tiny black cat. There were tiny books on a tiny desk. Not dollhouse furniture. I think some of it was papier mache. (Sometime that year I tried unsuccessfully to make a papier mache dragon. Its head fell off on the way to school.) For the same assignment, I had created a badly drawn picture of a cat from a collection of short stories about cats. I can still feel today my astonishment at how wonderful her dioramas were. I was stunned at her creativity, her skill, her ideas–and it certainly never occurred to me that she struggled with reading! So I hope I’m really clear here. I have admired Adrienne for many many years, for her sense of style, her ability to create, her art, her skill. When she came to visit, I pulled a new dress out of my closet (a Pucci I’d found used) and asked her how to wear it. And while she was here, she told me she’d felt bad about her struggles with reading. Struggles I had no idea about. I saw her strengths; she saw her weaknesses. And that brings me to that inner critic. The one we all have, the one that talks to us constantly about our weaknesses, about how we compare to other people, about the areas where we want to improve ourselves, about how we’re too fat or too thin or too slow or a lousy dog trainer (I had to get the dogs in there somehow) or a boring writer or a mediocre cook. That little non-stop voice that we listen to way too much. I’m not sure how to tell my inner critic to admire myself for my strengths as much as I admire other people for their strengths. I’m not even sure that would be a good idea–but I do want that inner critic to acknowledge that I have strengths! Oh, and here’s the photo of the Pucci bathing suit. Awesome, isn’t it?! This entry was posted in life with poodles on February 28, 2017 by Diana. Happy New Year! May 2017 move us all toward better health and greater happiness. I neither gained nor lost weight. While I still haven’t lost those last few (13) pounds, I have maintained. This is excellent, since I have not been being obsessive. I ran 639 miles, biked a lot, did two sprint (short distance) triathlons (3rd in my age group in both, although one was 3rd of 3 and the other was 3rd of 10), and learned more about trail running. Over the last four years, I’ve lowered my time in the Mt. Tabor Tar N Trail 5K from 45 minutes to just under 34. I did my best 5K of the year in January, though, in very flat Palm Springs (29:56). I’m hoping to better that this year. I did a lot of dog agility with Rush. I had a 35% Q rate in AKC and a 61% Q rate in CPE. 3 double Qs and a lot of points toward a MaCH in AKC (we’re somewhere around 600 points now). About 2/3rds of the way to Rush’s C-ATE in CPE. Yesterday was our last day of agility for 2016 and we finished with a first and ten points in Time to Beat and a 4th in Jumpers in a very fast group of about 15 dogs. I knit a few hats. I forgot to take pictures, though, with the exception of this one. Yes, it has a weird little who-ville thing going on the top. I was feeling silly. Dare I write “lose those last 13 pounds”? It’s been a theme for some years now. Oh, what the hell, maybe this is the year. Run more. I want to try to average 20 miles a week when I’m not doing an agility trial over the weekend. As I run more, I enjoy it more. I have been having moments almost every run where I find my inner 25-year-old and feel light and fast. It’s a joy. I think that covers it. Happy New Year again. This entry was posted in life with poodles on January 1, 2017 by Diana. Today my daughter Stacia and I ran the Mt. Tabor Tar ‘n’ Trail 5K run for the fourth year in a row, which is very cool. I ran a little less than two minutes faster this year than last year–and was first (last, only) in my age group. My progression over the four years is 46 minutes, 43 minutes, a little less than 36 minutes, and this year, just a bit under 34 minutes. That’s on a 5K course with 477 feet of elevation gain over the 5K, with trails, sidewalks, roads, stairs, and rocks. It’s not an easy 5K. Finish photos from 2013 (top left), 2014 (top right), 2015 (bottom left), and 2016 (bottom right). It’s an interesting photo to me because I like seeing how I’ve changed over the years. In October of 2013, I’d already lost about thirty pounds. I’d started walking the dogs longer and faster, but I wasn’t really ready to run yet–it was just too hard on my feet! By October of 2014, I discovered that Hoka shoes allowed me to run without hurting my knees too badly… but I was still only about 30 pounds down. October 2015, I was down a total of 50 pounds–and right now (October 2016), I’m down 60 pounds. Stacia and I are amused that we’re both wearing the same shirts we wore last year. This entry was posted in life with poodles on October 23, 2016 by Diana. Everyone who knows me knows that I am completely obsessive about shoes and am always searching for better shoes for agility. Currently I am wearing and loving the Skora Core, but they’re not a shoe for everyone–very minimal structure, zero drop, no padding. A few days ago, I was at a trail running shoe event and got to try two different shoes for short runs (a mile each). I took both pairs for a test over concrete, muddy dirt trail, wet grass. The other shoe I tried was the Altra Lone Peak 3.0. I’ve been running in the Lone Peak 2.5 for a lot of my trail runs and like it a lot. Nice roomy toe box, good traction, zero drop (which I like, but it’s not for everyone). The 3.0 version is better. They’ve managed to improve a great shoe. Still has good traction, but they’ve snugged up the mid-foot around the arch without getting rid of the nice big toe box. It’s a heavy shoe, though. You certainly won’t feel rocks through the sole. This entry was posted in life with poodles on October 22, 2016 by Diana.